Ransomware is becoming one of the most common ways a business is attacked, and it's costing tens of billions of dollars a year. No industry is immune; governments, healthcare providers, non-profits, banks, public utilities, manufacturers, the list goes on. So what can you do stop it? Quite a bit actually..
Help! I think I have ransomware! Backups are the single biggest way to protect yourself from ransomware. You can't stop every user from clicking on attachments, but if you have good backups in place, you can restore infected files. The quality of your backup solution determines in the infection will lead to 10 minutes of downtime, or 10+ days... 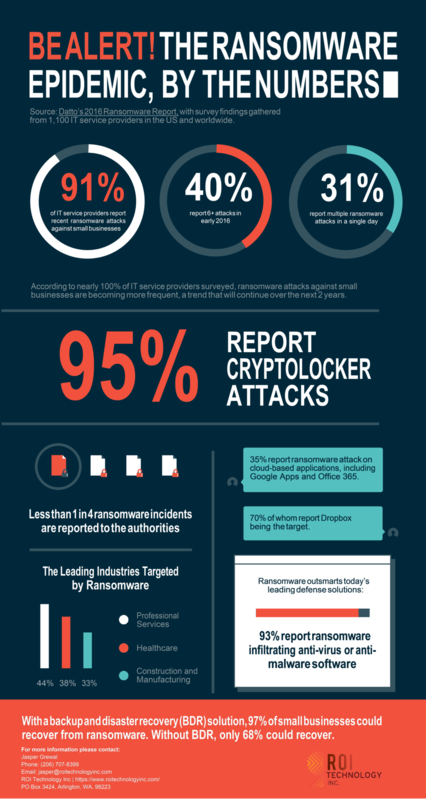 If you're not sure how long it would take your business to recover from ransomware, give us a call today for a free evaluation. If your network becomes infected, who will you call? How long will it take them to respond? By the time a user knows they've been infected, it's often too late, and their data (or the data on your shared drives) has already been encrypted by the ransomware. The next few minutes are critical, and if you don't already have a trusted IT partner that can respond right away, you may lose your data. Before your infected, contact us to discuss methods for securing your network and data against ransomware. Ransomware doesn't magically infect systems without some interaction from a user; they may not mean to, or even know what they did that lead to the infection, but users are the cause of most ransomware infections at SMBs. Antivirus and antimalware can help, but user education remains the best preventative measure the average business can take to combat ransomware. The time between infection and detection is critical; ransomware will often lurk behind the scenes, encrypting your valuable data before presenting itself to a user. Our state of the art backup solutions check each backup for signs of ransomware in a way that no antivirus or firewall can match. When ransomware is detected, we are able to act swiftly and squash the bug before it causes major business disruptions.